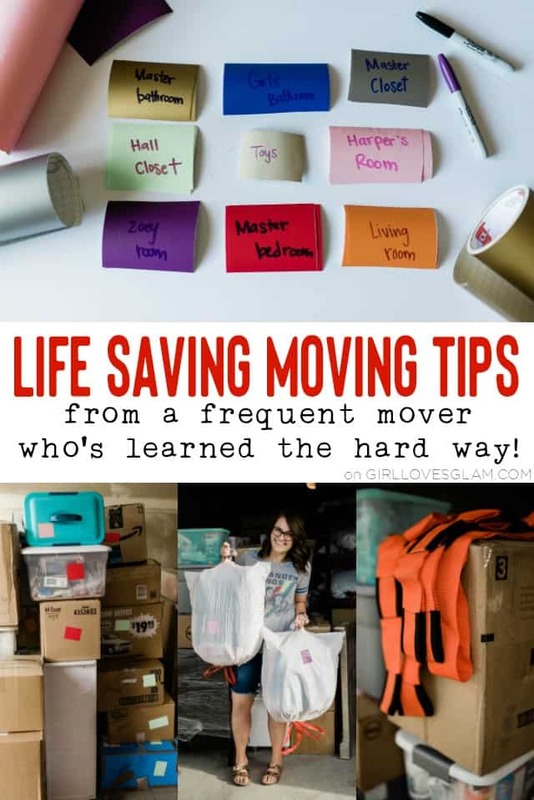 I hope these life saving moving tips will be just what you need! We used to label things based on the room we were packing up but we realized that they were all ending up in the same room and we couldn’t even find what we needed. The reason this was happening was because people didn’t know what rooms were what when they were unloading. We now have a much better system. I buy removable vinyl from Expressions Vinyl in lots of different colors. 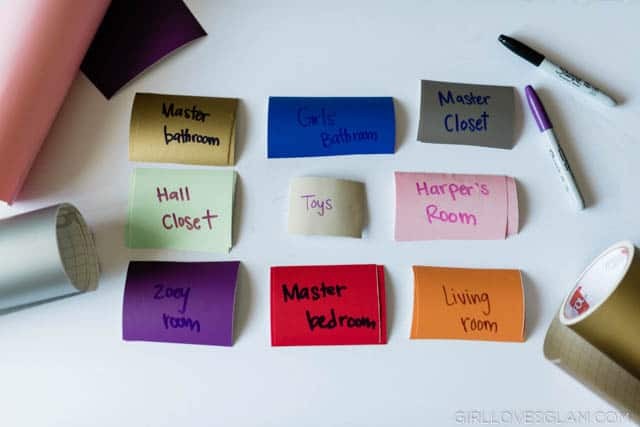 Each color represents a different room, closet, or bathroom. I create a key to show what each of the colors represent. When we pack up, we don’t need to write on the boxes, just put a scrap of vinyl on it. Then when we get to the new house, I take the same color of vinyl and put scraps on the doors and walls of the rooms they belong with. These labels photographed above were the vinyl pieces that I put on the doors and on the walls of our house when we moved in, so I didn’t need to use the key as I was rushing to slap the vinyl on before everyone brought boxes in. When people unload the truck, they grab a color and set it in the room with the same color, next to the closet with the same color, or in the bathroom with the same color. It has worked wonders! We used to take all of our hanging clothes off the hangers, pack them away, and have to pack up the hangers too. When it came time to get them all unpacked, it was such a mess! The hangers would get tangled up, they seemed to take up way too much room, and it just seemed like a giant waste of time. We learned that the trick is to keep the clothes on the hangers! But you don’t want the clothes getting thrown around or getting dirty. 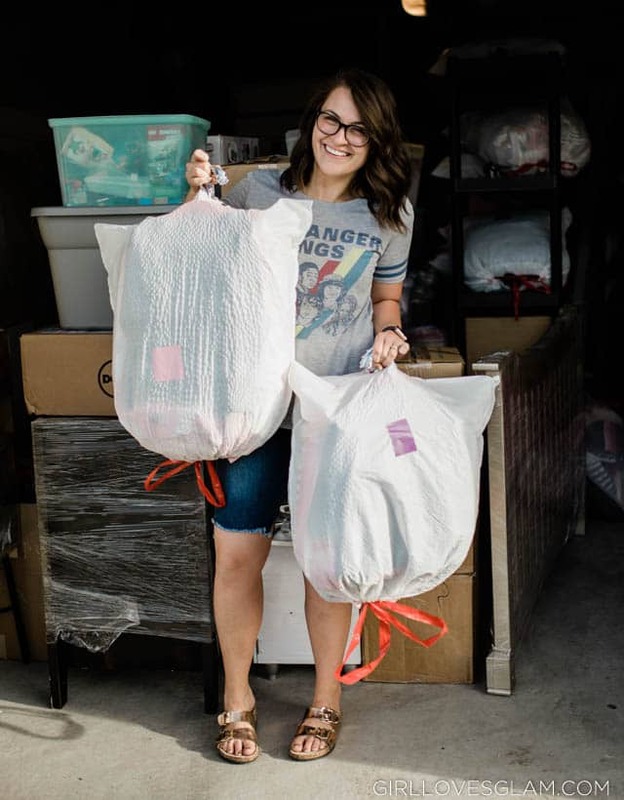 What we do now is turn garbage bags into makeshift wardrobe bags by poking a hole in the bottom to put the hangers through, putting the clothes in the bag, and tying up the bottom of the bag to hold them all in there. We labeled the bags with our colored vinyl to show what closet they belonged in. Then when it came time to unpack, we just cut open the trash bags and hung the clothes right up! I can’t even tell you how many pieces of furniture we have owned with giant scratches on them because of moving! It was so annoying that we would carefully move them, pack them up nicely in the truck, and even move them into our house with care, and they would STILL get damaged. 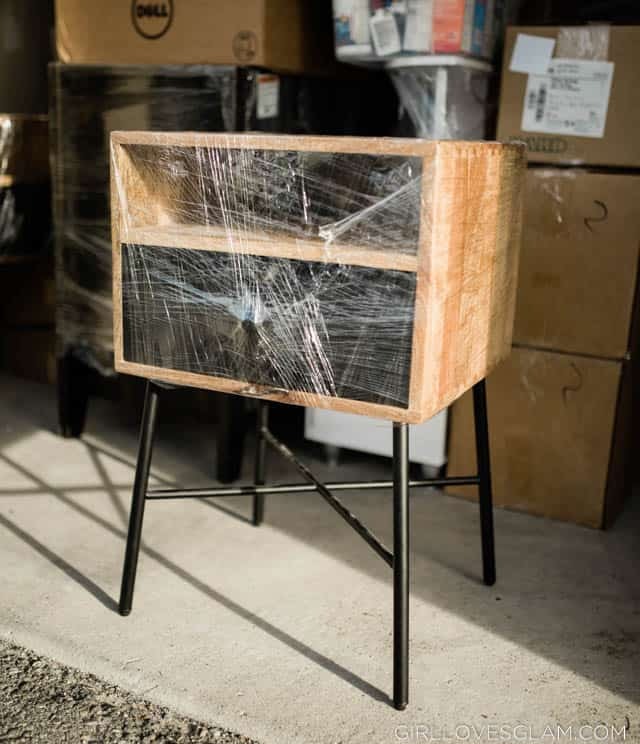 We started wrapping our furniture in plastic wrap and it has made a huge difference! 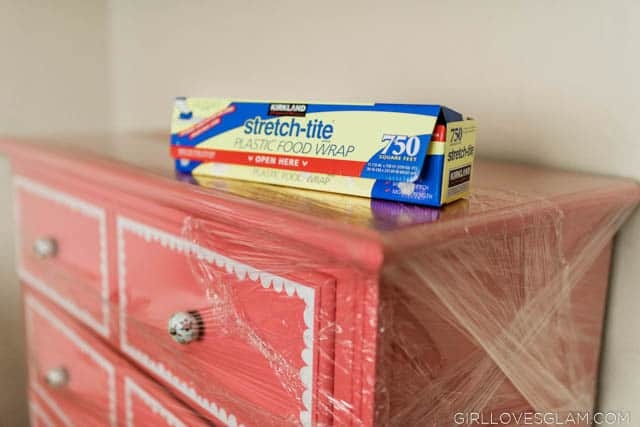 We buy the plastic wrap in bulk from Costco and go to town on all of our furniture. 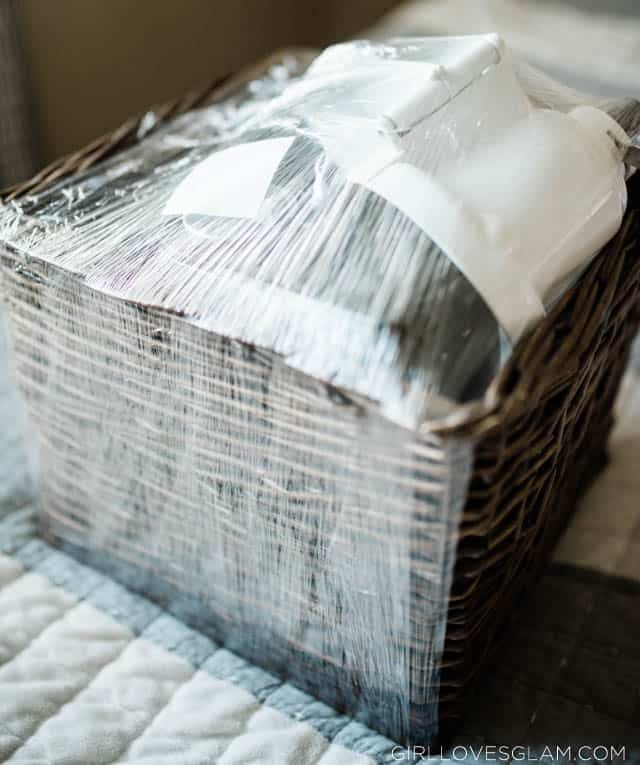 It doesn’t take that much longer to just wrap them up and it saves yourself from a lot of heartbreak of having damaged furniture. Another bonus to putting plastic wrap on your furniture is that you can keep stuff in your drawers and it becomes its own moving box. We keep most of our dressers packed up and just pull out what clothing we need before the move. Then we wrap it all in there. It is a little heavier (we also have a trick to helping with heavy things coming up) but it is so worth having it already put away when you get moved in! All you have to do is cut the wrap off of the dresser and move things to where they go, after they have shifted in the move. It is glorious! My rugs would always get dirty from moving and I was tired of it! They would be used to put between furniture to protect them, but they would always get so dirty! I decided to roll up my rugs and wrap them up with the plastic wrap. My rugs came looking good as new! As you can tell, we love our plastic wrap for moving! When we moved about 5 years ago, we needed to move our washer and dryer to a second story. The washer and dryer are so bulky that they were going to be a mess to get up the stairs. Our new neighbor brought over some furniture moving straps that he had and they blew our minds! 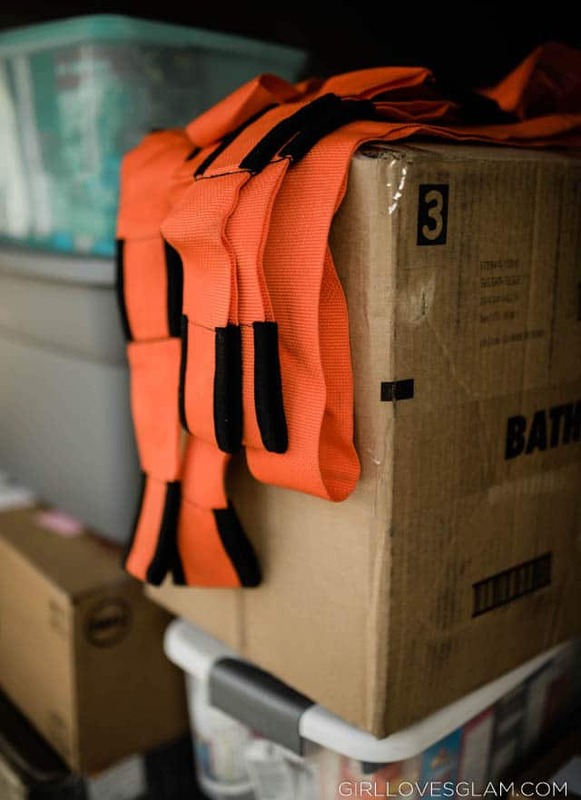 We have relied on these moving straps with every move we have had for our own family and moves we have helped with ever since! They make it so the weight isn’t held up all with your body and you are able to lift these bulky or heavy items with ease! They are totally affordable and you just grab them on Amazon. It’s a total win! 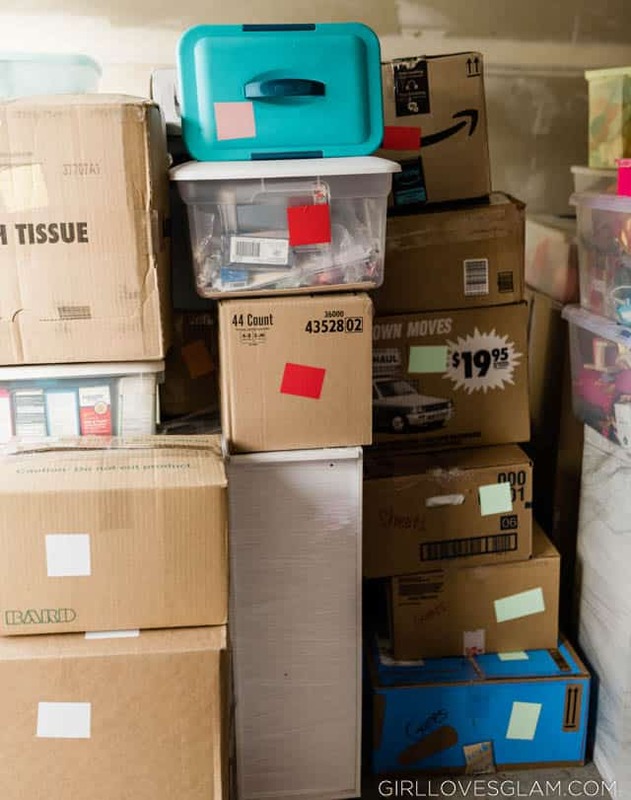 You don’t need to buy so many moving boxes, when you probably have plenty of open bins that you are storing things in already. Rather than move those open bins into a closed box, use that plastic wrap that I am sure I have already sold you on, to wrap them up! This saves you the money from having to buy more boxes than you actually need! No matter how organized your move is, you will still probably struggle to find a few of the house essentials for those first few days. I have started packing a duffel bag with things like hand soap, toilet paper, paper towels, paper plates, bowls, spoons, forks, cups, tissues, and any other little things that you will want to use immediately. This makes it so we aren’t opening up a million boxes, just to try to find toilet paper. We have what we need immediately and can work on opening boxes in an organized manner. We would end up going out to eat a lot during a move. When we were packing up and when we were unpacking. That adds up quickly! I have started preparing in advance and will either make some freezer meals that I can use before and after the move or I will do some sort of meal service like Home Chef that I can order the meals we want to make and have them delivered to our door. If I do the meal service, I have that just come to our new address so we can cook them at the new house. 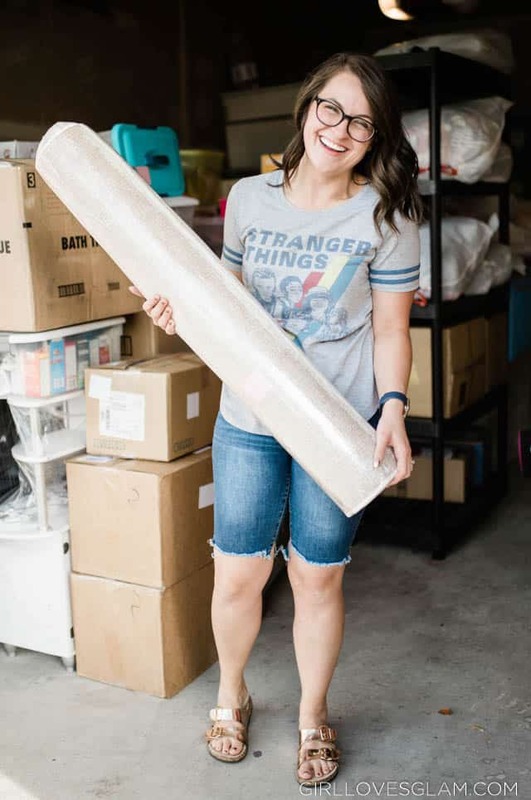 We have learned a lot about moving over the last decade and I hope that these tips can help your upcoming move be as smooth as it can be!